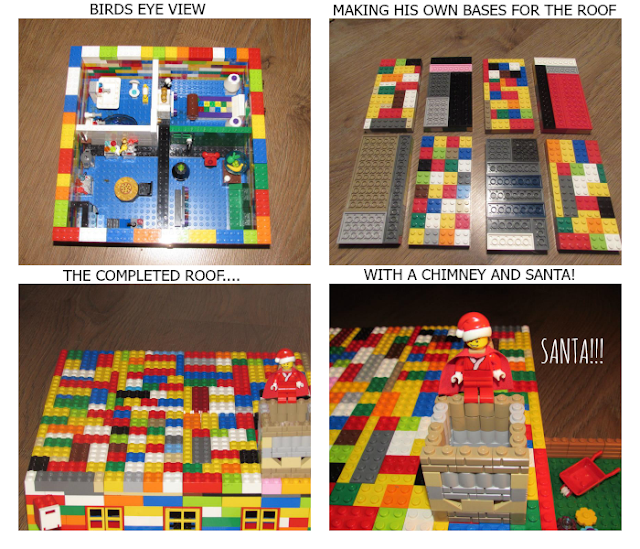 Spud was invited to take part in a Lego challenge/competition hosted by Ocean Finance for a child to create their dream home. 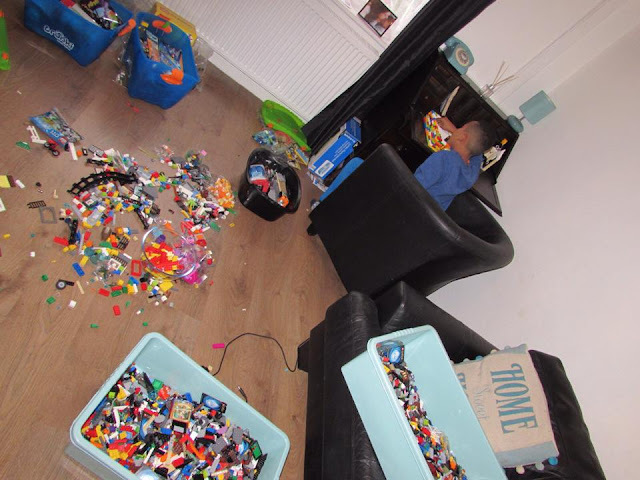 What I expected from this challenge to be honest was just another blog post, another box of Lego for Spud to add to his collection, but what I didn't expect was me taken back by shock and amazement, along with the rest of the family! 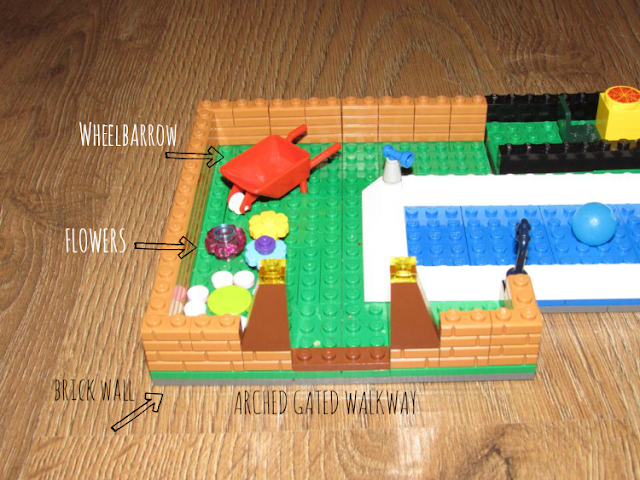 I admit, I've never took much notice to Spud's Lego designs, however, after losing my son to this competition for the last three weeks, I have now realised without being biased how good he is at Lego and how much he loves the stuff - which of course I already knew as he has five big boxes of it! What I didn't expect to see was so many thoughts to go into this, so many details, so many hours - it's took me five hours alone to write this post and edit photo's, let alone the countless hours Spud has spent on this. Spud painstakingly broke up loads of Lego sets, totalling over hundreds if not a few thousand pounds! Spud doesn't even like me hoovering near them, and won't let anyone touch them in fear of them getting broken, so I was quite surprised when he started destroying sets to make his #OceanDreamHome. When I asked Spud what inspired him to build his home, his answer was us, my family. 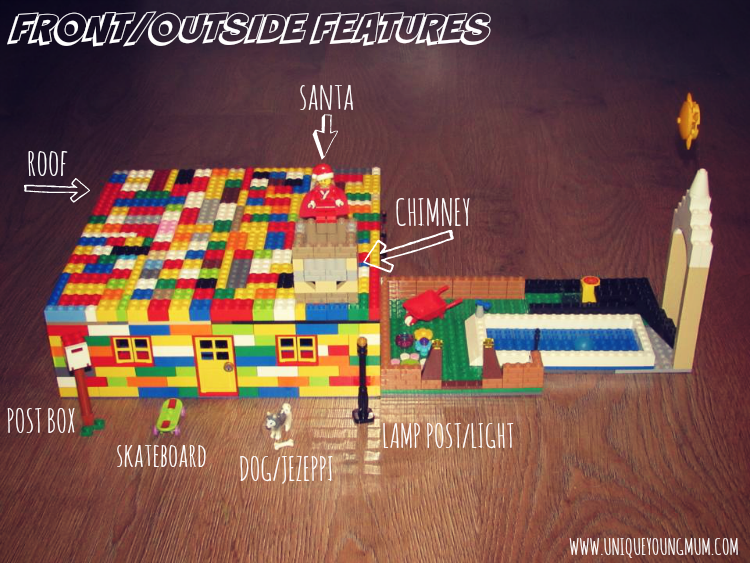 We lived in a flat for so many years, all Spud ever dreamed of was having a house, or at least a garden to play in, and a chimney for Santa so he could leave presents for Spud. Spud is nine, still at the believing age, and so I thought it was lovely that he's included all his dreams in one product! I hope you enjoy his design as much as I do, I'm one extremely proud mummy who has pledged silently to herself to take more notice in his creations! 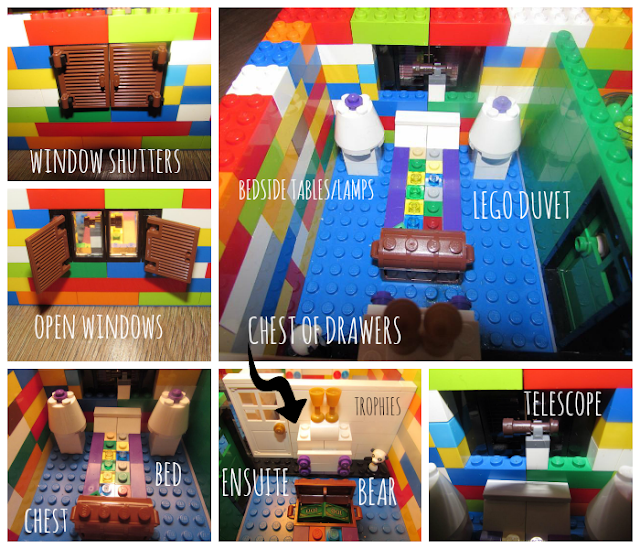 I may have a future Lego designer in the making here! We would love to see some comments as Spud has worked extremely hard on this! I will be publishing comments, and monitoring of course before showing them to Spud! P.S - Spud really wanted to include a mini-figure that he could pretend was himself, but sadly couldn't find one with the same colour skin as him so he decided to leave that out, and just feature Jezeppi and Santa! 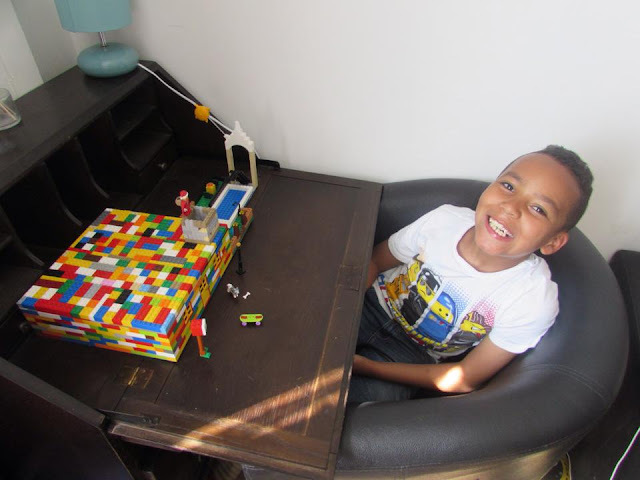 Spud designed his dream home using just his dreams for when he's older! He wants a bungalow so he doesn't have to go up and down the stairs and chase Jezeppi! He would love a garden with two chairs and a table for his favourite food - pizza! Spud would also really love a chimney when he's older so Santa can easily reach him to leave him presents! Jezeppi - Spud's puppy dog will also live in Spud's dream home, but there's no mention of mummy! 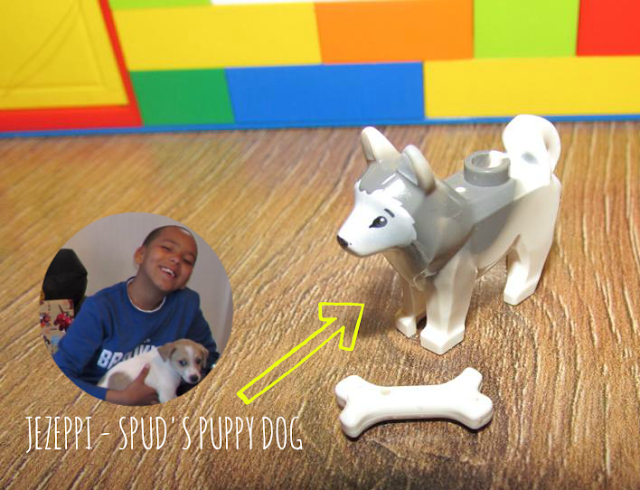 To me, it comes as no surprise that Spud used one of his Lego dogs (and bones!) 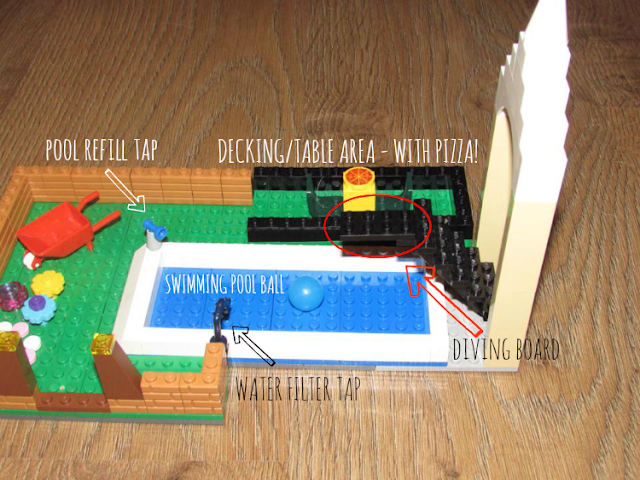 to include his real life dog Jezeppi into his dream home. Spud always wanted a dog, and was ecstatic when he got one this year for his 9th birthday, their bond is unbreakable! 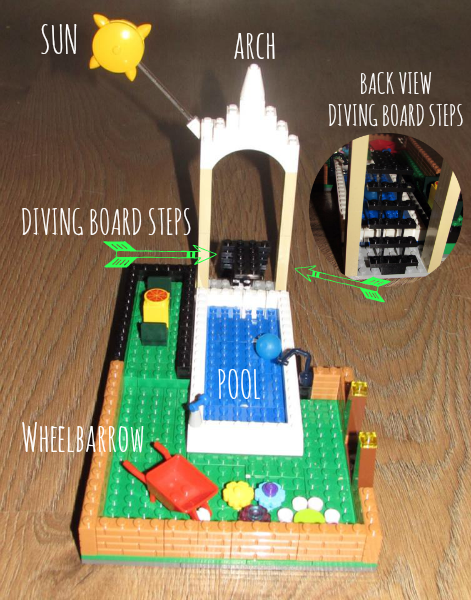 Rear view of steps to diving board. 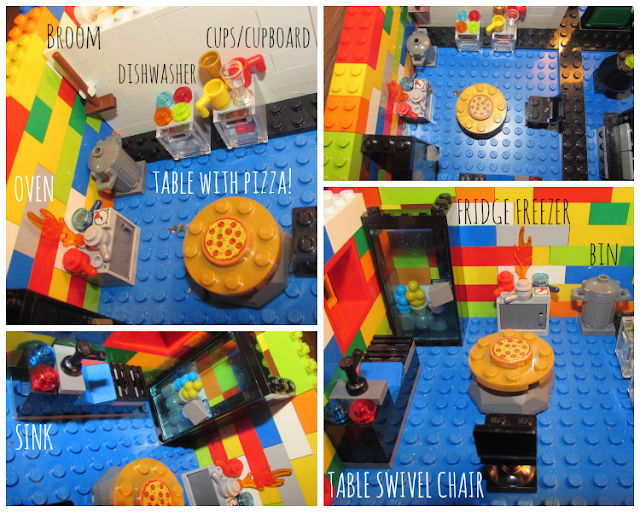 Inside coffee table: playing cards, Lego newspaper and Pizza takeaway leaflet! 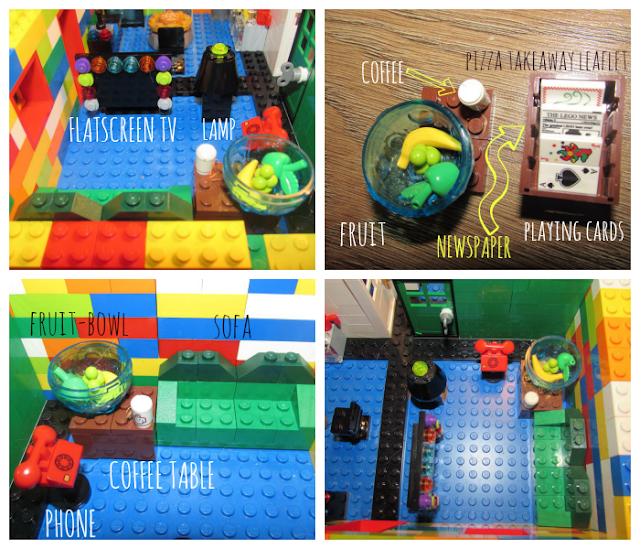 Fruit bowl including an apple, banana and grapes! Lounge window - seen to the left of the tv! Oven with opening door, timer, flame and pans. Fridge Freezer with opening door. Sink with hot and cold taps and draining board. Toilet roll holder that actually spins! 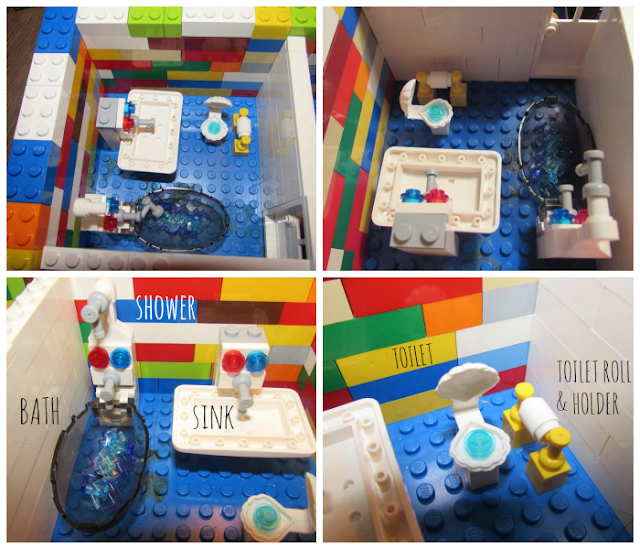 Toilet using a Lego Mermaid Sea Shell! Separate bath and shower tap/s. Sink with taps using the bonnet of a car! Full enclosed room for privacy. At one point, I thought there was going to be tears from Spud when it come to the roof and Spud couldn't find his other base plate. I had to tell Spud to give the design a rest that day as he was getting too upset about it and I'm glad I did! Spud woke up the next morning with a brilliant design that I honestly didn't think would work, next time I'll just believe the 'expert' the first time round! With no time to purchase a base plate in time, I did start to think oh no, as he had told me all of his plans, but luckily his quick thinking idea of making his own little base plates was amazing, and he now has one of the coolest roofs in town! Why Does Spud Think His Home Is The Best and Why He Should Win? Why Do I Think Spud's Home Is The Best and Why He Should Win!? 1: Santa Clause - a lot of children believe in Santa, and I've been worrying that Spud may already know 'the truth' from his peers at school, however, his design just proves that he still believes. 2: Jezeppi - Myself and Spud lived in a flat for over seven years, he would constantly cry and get upset, asking why other children had a garden but he didn't? One day Spud then said because I can't have a garden, can I have a puppy!? I then had to break it to him that a puppy also wasn't possible due to our tenancy. Every Christmas Spud would write to santa and without doubt, the first two items on his list would be a garden and a puppy! In November last year, we miraculously got moved from our flat into a house making one of Spud's dreams come true, then in March this year, for Spud's 9th birthday, Jezeppi entered our family and their bond is unbreakable. To see how much Spud notices things is amazing, although he never uses the bin and instead leaves rubbish around, and I don't have my broom on my kitchen wall, it's made me realise just how much my once little baby boy has actually grown up! Please don't forget to leave a comment if you can, Spud is looking forward to reading any that may be left! He's so excited over this whole thing!